A rhythm section and five (!) trombones - what a unique experience! MODERN JAZZ , LATIN, FUNK AND TROMBONES have one thing in common… they are the explosive sound of SLIDE-O-MANIA. Here is where the sound of five trombones meet swing and funky grooves and where intricate, dynamic horn lines lay the foundation for outstanding soloists. 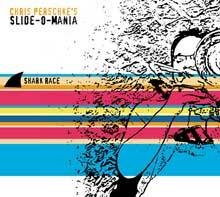 The musical leader of SLIDE-O-MANIA is Trombonist CHRIS PERSCHKE. Chris has performed in and been inspired by diverse musical styles. He has been the arranger and trombonist of Big Band “Big Brazz Pack”, has worked with composer Maria Schneider and was given his formative lessons in FUNK while working for the master himself: MACEO PARKER!! SLIDE-O-MANIA reflects all these influences and more! The 5 piece trombone section impresses with sophisticated arrangements, exacting ensemble work and brilliant solos. The horn section consists of Chris Perschke, Allen Jacobson, Stephan Schlett, Thomas Sauter (trombone) and Michael Wirz (basstrombone). All young pros who CAN PLAY! The „Pulse“ of the band and those responsible for setting up the „serious“ grovves are the „Hot and Happenin“ Rhythm Section of Ernst Seitz (piano), Florian Werther (bass) and Florian Hermann (drums). Swings so fine you can’t sit still.